Justine Jones is a hopeless hypochondriac whose life is crippled by fear…until one day when a handsome, tortured mastermind named Packard peers into her soul and invites her to join his psychological hit squad. Justine resists until she gets a taste of the peace Packard can promise. At first, Justine enjoys being part of the thrilling world of neurotic vigilantes who battle Midcity’s paranormal criminals. 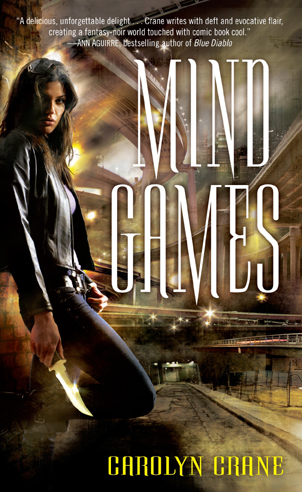 Things get complicated when she uncovers certain secrets…and falls for one of her most dangerous targets. It's no secret that I love urban fantasy, so I'm always looking for new books to get stuck into. I love discovering new worlds filled with interesting characters and intriguing situations. And this is the latest gem I've discovered in this wonderful genre. Justine Jones is a hypochondriac. She's also a neurotic mess who is convinced she's got vein star syndrome. She spends most of her time freaking out about it, analysing the symptons, and visiting the ER to make sure there's nothing wrong. But even then, she's still convinced she could die at any moment and lives in constant fear. A chance meeting inside a Mongolian restaurant changes the path of her condition. For the first time in her life, she's able to see that all this stored fear she carries around can be turned into something else. Or rather, can be 'pushed' into someone else to help rehabilitate their evil ways. Meeting Packard and his disillusionists helps her discover a lot about herself and what she can really do to others, but it also messes with the 'normal' life she's always wanted. This book was an amazing ride filled with action, tension, twists and turns. I absolutely loved the concept. And there are plenty of possible love interests for the heroine. I really like this twisted and dark world of highcaps and disillusionists Justine lives in. It's awesome to see something so negative be used for long term positive results.